Welcome to the most hectic month of your teaching year (lots going on at school and at home, kids getting sick, etc.)! Luckily, it’s also the most fun and usually the shortest month, thanks to the Winter Break. Have you gotten your first cold or illness yet? Have you gotten your FLU shot yet?? I can answer yes to both of those questions! I know some of us are weird about vaccinations, but don’t forget your flu shot! You might also want to look into a Whooping Cough booster- I’m already starting to see outbreak information in the news! I want to start today’s post by giving MAJOR props to the Teacher Support Team at my school. Can you think of a better gift to get to start December than this? The gift is hand sanitizer, tissues and other health hygiene items. They got the gift right for teachers! Just when I’m starting to feel cold and flu germs are taking over my life, this comes in to save the day. 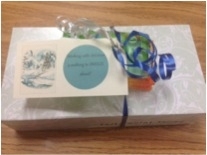 Great idea if you need to share gifts with your staff! 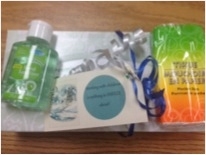 Not a bad gift (personal hand sanitizers) to give to your students as well. This also is a really great time of year to break out your Glo Germ Kit and do a refresher on hand washing. The backlight hand washing training, in my opinion, is the BEST way to teach kids about germs, especially in the younger grades. Glo Germ gel or powder is so easy to use- it requires no lesson preparation. Germs are such an abstract concept because you can’t see them, but the UV black light takes care of that! It gives your students a visual that is really powerful in helping them understand where germs can hide if they aren’t washing their hands properly. I have found that the more frequently I do this lesson with my class, the more I observe them practicing good habits for hand washing. It also makes them very aware of where they are coughing, sneezing and touching. Thank goodness. I hope you can weather this month and still have some Christmas cheer at the end of it!